410BC is a clothing company after my own heart. I’ve worked with them a few times in the past with each collaboration being a positive experience. The first tee is based on a rejected cover concept for the (now defunct) magazine UR Chicago. The cover needed to portray young couples getting the squeeze as they make their first forays into the workaday world. It was a statement on the shrinking of the middle class if I remember correctly. I envisioned a bloated, suit encrusted, balding, banker-monster as a potential centerpiece for the cover. It was deemed over the top and we decided upon a Patrick Bateman sort of chap, leaving the monster character to sit in a dark corner of my disease-addled brain. When 410bc mentioned corporate greed, I wanted to revive the concept. The second tee is based on memories of a mythology course from elementary school. I spent an inordinate amount of time studying Greek mythology as a kid. As you can imagine, it was a big hit with the ladies and made me very popular with the student body. Here, I tried to incorporate a symmetry of sorts. Zeus, Hades. Apollo, Charon. Fire, water. Good, bad. Life, death. Lastly, we have Lady Justice. I’d like to see this one printed large on the shirt. I hope to illustrate for 410BC in the future; great group of people. I never got around to posting my diptych from I Am 8-Bit. The image fits together when hung side by side. Almost no one besides other presenters knew who Jim was! My faith in today’s youth was diminished! Motherland, a swell heap of gents as well as a “…Motion, Animation & Entertainment Company…” asked me to provide the art for the series of viral shorts for the band Black Tide (seen below). Black Tide “Warriors of Time” No. 1 from Ray Frenden on Vimeo. 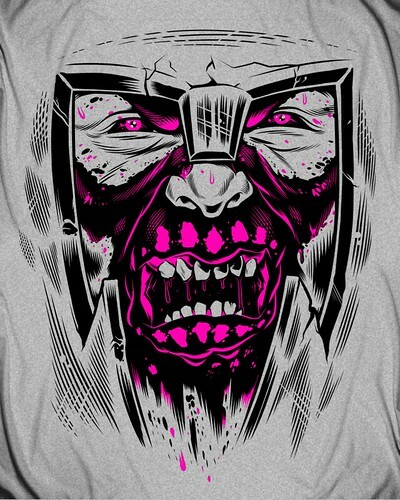 Black Tide “Warriors of Time” No. 2 from Ray Frenden on Vimeo. Black Tide “Warriors of Time” No. 3 from Ray Frenden on Vimeo. 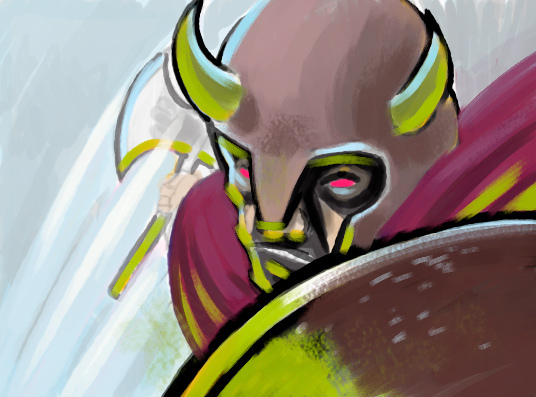 Black Tide “Warriors of Time” No. 4 from Ray Frenden on Vimeo. 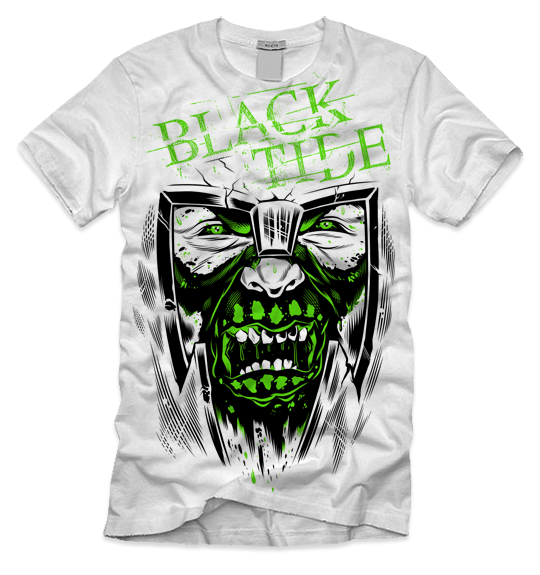 Black Tide “Warriors of Time” No. 5 from Ray Frenden on Vimeo. They provided the character design, reference renders, storyboards, and even frame-by-frame reference for the bits where traditional animation was required. It was a lot of work (with some shots in the fifth video having more characters in one instant than the entire first video’s run). The way they animated the paper dolls I provided is humbling. I learned a lot in the process and am even tackling my own motion projects as a result. All in all, it was a great experience! I’ve even gone on to design other merchandise for the band. After the jump is a sampling of the provided reference, my production art, and the illustrations I’ve done of the character since. 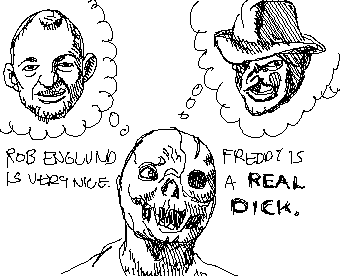 I think anyone reading my blog has sense of humor in line with this series of webcomics I made sometime in 2006 starring Jason Voorhees. Done using a single color MS Paint like app. Obviously, the art was not the focus on these! The first ten or so are pretty weak, but I think they are alright overall.